You must make reservations at least 5 minutes in advance of the time at Pub & Kitchen. 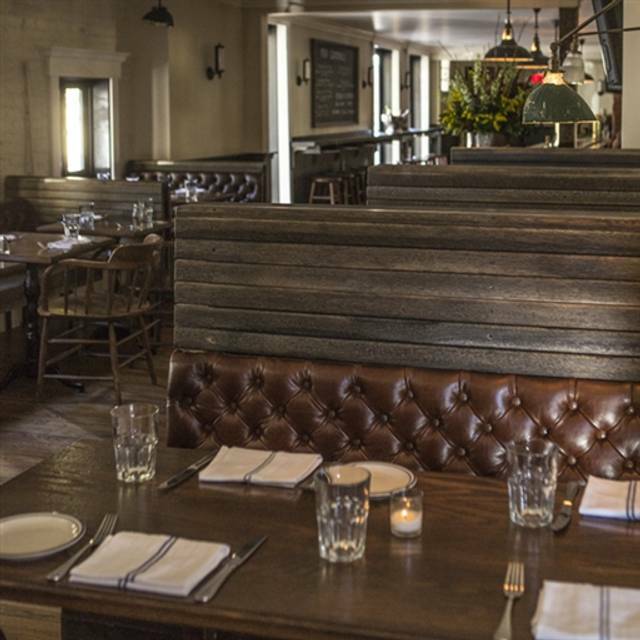 For more than nine years, P&K has been one of Philadelphia’s quintessential restaurants for quality dishes, craft cocktails and elevated farm to table offerings. Pub & Kitchen has been a comforting neighborhood staple with its selection of local beers on tap (“Pub”) and mouth-watering gourmet fare (“Kitchen”). Menu additions like fresh seasonal pastas and amazing seafood helped us garner a “three-bell review”: from Inquirer food critic Craig LaBan. The ever-evolving menu places an emphasis on seasonal ingredients and satisfying flavors. At the bar, enjoy a quirky selection of bar snacks, crafted cocktails or a nice glass of wine. Brunch offerings include dutch baby pancakes, classic egg dishes and powerful cocktails like the Wrangler, our spicy take on a Bloody Mary. P&K was a great spot for brunch! We enjoyed the beet salad appetizer, cheddar and ramp omelette, and the burger was fantastic! Highly recommend. We’ve been coming to P&K since it opened and we’re never disappointed. The menu and specials are refreshed often. The bar cocktails are well crafted and the beer selections usually have a gem or two. Noise can be a problem in the main room with the bar especially early dinners with parents who negotiate with their screaming child instead of taking them out for a walk to settle down. No consideration for other diners. Kids can’t behave...Applebee’s or take out. Anyway, service is exceptional without intruding. Food quality, creativity, portions and value are always worth the trip. Every thing was great except there was an unruly child melting down at the table behind us and that put a damper on the experience, so we removed ourselves. Appetizers were great and the special pasta was also exceptional. Menu was interesting. Execution a bit lacking. Some items slightly burned. My husband and I have been coming here for about 3 years. I was a huge fan of their burger. The French fried onions, whisky sauce and skinny shoe string fries. However, we went this past Saturday and their burger had changed. The burger had regular fried onions, regular fries and dijonaise sauce. I was so disappointed, the burger was just okay. I most likely wouldn’t come back from the burger, and would go somewhere else. We asked the server and she said they change their burger all the time? However, every time I’ve gone it’s been amazing until this past visit. Great local spot with fun atmosphere and vibe. So good that you might want to move — just so this place can become your neighborhood place. Never disappoints. Met with a Hinge date is been texting with for about a week. Ambiance was perfect for a first meet up, and food was amazing too (burger was cooked 👌). The grilled Romaine lettuce and the Brussels sprouts were very good, as was the service. The major drawback was the noise level, which had all the diners yelling to be heard. As a result, Pub & Kitchen is not a great place for conversation. It would benefit from more sound-absorbing materials on the walls and ceiling. The food here is always so delicious and creative. It is not the "pub fare" you expect! Our waitress was both incredibly well informed as well as helpful and appropriately personal and engaging. The food and service at Pub & Kitchen are great. I had the seafood pierogies for an appetizer and they were tremendous. For my main course I had the pork chop - it was a very nice piece of meat that was cooked perfectly. The sauces of both dishes were excellent. The one drawback to the restaurant is the noise level. We were seated in the small room to the side and large table was seated in there as well. We could barely hear each other talk. Not sure if there is anything the restaurant can do about this but I would still go back for the great food. Great winter menu full of delicious comfort food classics with a perfect twist! Thank you! Excellent menu and execution would highly recommend! Great service, drinks and food. Standouts are the burgers, brunch, well-curated beer list, and aperol spritzes. We stopped going to P) Waitstaff and hosts are outstanding. Very good food, just a bit short of great, supported by excellent service. A very friendly neighborhood restaurant that presents a feel at home atmosphere. Bartenders treated you like an old friend and P anticipate they will be tasty, too! Was during the eagles game but very loud and the food was ok but nothing fantastic. Family gathering. Very accommodating and good hearty food . Great burgers! Noisy, so be aware of that. Great place for brunch, very accommodating and the food was good. I would definitely return. Excellent food. Limited but well executed menu. Had the pork chop, was savory and tender. Appetizers and Desserts were also good. Great, friendly service. Very good Old Fashioned cocktail. Cozy, nice bar vibe. Good bar with good food. Stopped in for dinner before heading to hear a concert by the orchestra. Sampled the brussels sprout appetizer, the I split the filet and my son had their hamburger. Both entrees were cooked to a medium rare that perfectly done. The meat and the sides blended well and the fries with the burger were very tasty. The waitress was attentive and friendly, without being intrusive. An enjoyable meal with really tasty food. My friends and I met at Pub and Kitchen for Sunday Brunch and everything was great from the atmosphere to the food. I ordered the spicy Bloody Mary and tuna toast and both were fantastic! I would come back again for sure! This was a great brunch find for our group! Amazing food! Get. The. Deviled. Eggs. Ok, maybe an old fashioned as well. We had an overall great experience. The food was delicious, our sever gave us great recommendations. The atmosphere is quite loud and yet it is a cozy restaurant. Don't forget, get the deviled eggs! Thank you so much for the gracious review, DanP! We look forward to hosting you again! Excellent food , service and at atmosphere! We had Sunday brunch and it was wonderful. The weekend before I hosted a baby shower in the upstairs room and everything was perfect-the food, the space, the drinks and especially the staff. It was perfect! Thank you! We went for Saturday brunch. I got the French toast - which is amazing. My vegetarian husband got an omelette that he loved. Usually love it here but had a bad experience. Ordered the omelet which did not contain all of the ingredients mentioned on the menu and the toast was black on both sides completely. Additionally, the server did not check on us once until we went out of our way to get our check. I’ve been here a lot and always like it but service was rough during my last visit- two of the three entrees were brought out 15 minutes before the last and I had to get another waitress to grab me a drink because ours went missing. Normally really like it so hoping it was just a one off! I went here with some friends for a late dinner. The ambience is really nice and it has a comfortable, laid back feel. The menu has good variety and so did the specials. I opted for the 12 oz NY strip. I was thoroughly disappointed. The meat was bland and undercooked (I like a bleeding medium rare so this is saying something). Quite let down for a $32 steak. Will not be returning or recommending to others.